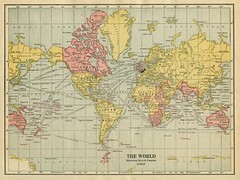 There’s something both alluring and exotic about maps that has captured my curiosity from an early age. They hint at possibilities beyond boundaries, of adventure and new discoveries. But at the same time they provide certainty: a reference to help navigate uncharted territories, offering reassurance that you can avoid getting lost with the help of your new-found companion. I grew up with a map of the world on my bedroom wall. I think it came free with the vouchers you saved from buying petrol in the 1970s (remember that, anyone ?). My 8 year old son now has a similar map just above his bed which has now opened up a whole new world to him – literally. Only trouble is, Australia is closest to his head when he’s trying to get to sleep and so his questions are focused on Australia and New Zealand (which looks like a ‘sunbed’ according to him, incidentally). He already knows that Uluru is the Aboriginal name for Ayer’s Rock and I’m sure he’ll be an expert on Australasia by the time he’s 15, since Europe, Africa and the Americas are at least another 20 cm from his head ! Perspective matters. Maps create mental models and models influence behaviour. My world map was centred on the Greenwich Meridian and although the UK wasn’t positioned right in the middle of the map it seemed to me, growing up, that the map of the world was deliberately drawn with the UK at the centre. The expanses of pink – Australia, Canada, India, South Africa and so on – gave reassurance that the UK really was at the centre of the Empire and the world. (No need to respond, folks, I’m wiser now …). Your perceived location has a huge bearing on how you see the world and see others. I really like this diagram, taken from the American Kid blog. Here we see that not only does perspective matter but it has mattered so much in history that we’ve got ourselves rather confused over geographical reference points. Anyway, back to the point. Maps opened my eyes to the world, a passion for discovery and travel, a yearning for adventure, a career (via a degree in Geography), and hobbies that see me traipsing off to the back of beyond. If, like me, you appreciate the beauty of maps then there’s no shortage of inspiring cartographic material to whet your thirst for adventure. We are lucky in the UK to have a long heritage of mapmaking expertise, with the Ordnance Survey providing – quite literally – a Survey for the Board of Ordnance (the forerunner of the Ministry of Defence) since 1791. The pink Landranger Series of Ordnance Survey (OS) maps are intimately recognisable to everyone in this country, covering the UK in 204 1:50,000 scale maps (of which 85 cover Scotland), each covering a 40 x 40km squre of land and seascape. However, the first main commercial mapmaker in the UK was John Bartholomew & Sons of Edinburgh, founded in 1826. The family-owned firm was passed down through five generations (all of them called John) before eventually being sold to the Readers Digest in 1985, the passing of the last ‘John’ in 2008 finally ending the distinguished line. (Incidentally, early 19th Century Edinburgh also witnessed a variety of specialist reference materials including not only Bartholemew’s but also the Encyclopaedia Britannica, The Scotsman (newspaper) and the publishing houses of Constable and A & C Black). Whereas the pink OS maps, the new metric maps introduced in 1974 to replace the old one-inch-to-the mile series, are a textbook example of 1970s visual functionality, they lack the nostaligic charm of the blue-covered Bartholemew’s half-inch series of maps mounted on cloth. Look in any good secondhand bookshop and you’ll see a few of these lurking in a box somewhere. I love these maps. They conjure up images of early motorists setting off on long journeys on single-track highways and byways, dressed in tweeds and goggles. Of climbers and mountaineers taking overnight steam trains up from London to conquer untamed summits. Of youngsters on bikes spending long summer holidays exploring Scotland, staying at youth hostels along the way. The Central Perthshire map I bought a couple of years ago – covering my home town – was produced from Bartholomew’s Park Road printworks in Edinburgh between 1891 to 1911. There were 29 half-inch scale maps (each measuring 20 x 25 inches) covering the whole of Scotland. The cloth-covered maps cost 2 shillings, twice the cost of the paper maps, and were “to be had at all the leading Booksellers and Railway Bookstalls“. I hadn’t realised that road numbering was only included on the maps from 1921 after the Department of Transport introduced the new road numbering system in 1920. John Bartholomew’s & Sons were innovators. The colours they used on their maps to illustrate contours have influenced mapmaking the world over ever since, differentiating between light/deep blues for depth of water, greens for low-lying areas and different shades of brown for hills, culminating in grey then white for the highest peaks. Each colour had to be printed separately; this was an art as well as a science. To get a sense of the difference this design innovation had, compare the equivalent Bartholomew’s and Ordnance Survey maps of the Cairngorms from 1894 (and also with the Google Hybrid map). From a design perspective, the Bartholomew’s map is in a different league. I have a collection of later Bartholomew’s maps from the 1940s and 1950s, produced from their Duncan Street premises in Edinburgh. The “Revised Half Inch Contoured Maps” were also manufactured on cloth and cover the whole of the UK in 62 sheets. As I sit here at my study desk I’m surrounded by four different kinds of framed maps on the walls and a shelf full of OS and other maps. There’s much more than can be said about the joy of maps and I’ll provide a series of posts on this topic over the next few weeks. In the meantime, while researching this, I was delighted to learn that the National Library of Scotland has an exhibition taking place until May 2013 – ‘Putting Scotland on the Map’ – that charts the story of Bartholomew’s maps. You can also see a short BBC film describing the exhbition shown on TV recently. I’m sure I’ll be visiting soon.